The summer of 2018 has come to an end and thus this is the perfect time to plan your next vacation for the upcoming colder months. This year take the unusual plunge and visit Mexico. A vibrant country rich with culture and variety of experiences. One of the world’s most fascinating city and it has a lot to offer than you can imagine. With a population of over 21 million, the city is known for its bi-centennial crowd. The Plaza Garibaldi is the Times Square of the city and has its own mariachi-filled charm. Also, many restored colonial buildings show details long obscured by years of pollution build-up. Meanwhile, this ancient city built over a filled-in lake has Aztec canals, pyramids, Diego Rivera and Frida Kahlo's old studio, and hipster dining in chic eateries of the Condesa and Polanco. The Caribbean resort town on Mexico’s southeast coast is a magnet for divers, fishermen, history buffs and pleasure-seekers. A popular destination since the tourism boom of the 1980s, Cancun’s charms extend far beyond its raucous “Spring Break’ reputation. A wide range of aquatic activities, and centuries of Mayan, Mexican and Caribbean history and culture make Cancun a destination for all kinds of travelers. Located on the Yucatan Peninsula, Cancun overlooks the Gulf of Mexico. Just offshore runs a huge coral reef, providing Cancun visitors with some of the best diving spots in Mexico. Snorkel straight from the shore at Playa Tortugas to discover colorful species of local fish and marine plant life. 3) Merida is gorgeous colonial city about three hours inland from Cancun. The buildings are well-preserved and brightly colored. The city itself is the best place to enjoy amazing Yucatecan foods like cochinita pibil, papadzules, and panuchos. The city is best on weekends, when the historical core – a scene of 17th-century cathedrals made from Mayan bricks – closes to vehicles and fills with open-air stages, taco stands and balloon vendors. 4) Tulum is known best for the stunning Mayan ruins that hug its coastline, but there’s a lot more to Tulum than this one-day outing. There are romantic cabanas on the beach and high-end restaurants like Hartwood where people line up hours before dinner service just to get a table. For something more mellow, stay in the town of Tulum where you can take yoga classes, drink freshly pressed orange juice and eat late night street tacos. The best way to get around is by bicycle. Known for its natural features and blazing temperature, Baja California Sur is Mexico’s melding of desert and ocean. Its location, with the Sea of Cortes on one side and the Pacific Ocean on the other, gives one a sense of being on an “island-like” sanctuary. The area has several high-end resorts and spas, beautiful beaches, and near-impeccable year-round weather. La Paz, is more of a commercial and cultural center than a vacation destination, although it does attract eco-tourists looking to enjoy La Paz’s marine wonders and aquatic activities. It is home to the Museo de Antropología e Historia and La Ruta de las Misiones. Summer is highly anticipated unfortunately it is always short lived. That is why it is important to get the most out of your days by getting OUT! Hiking is one of my personal favorite past-times and apparently a new trend among young adults my age (I’m 21, however I think they go just to post a photo on Instagram) Not only is hiking a great form of exercise but you get to see and experience things you would other wise miss. Toronto has a lot to offer. However sometimes it is nice to step away from the blaring car horns and traffic noises and into a real secluded spot. 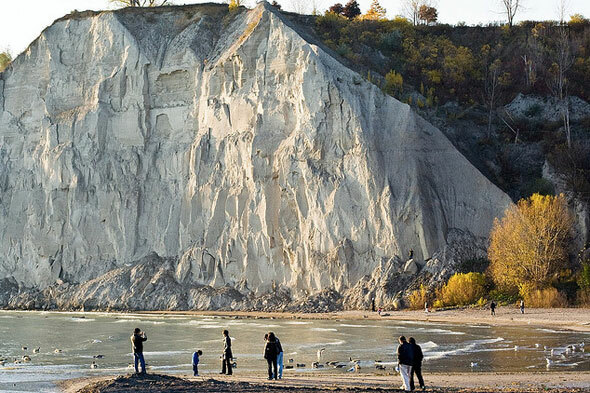 Scarborough Bluffs is a beautiful oasis just on the outskirts of Toronto. Located in Scarborough this park is not to far from civilization however it offers complete seclusion and breathtaking views. Not much of a trail, it is a great day trip to explore the shore and beachside along with a picnic! Dundas Peak and the Spencer Gorge loop is a great hike to do with a small group. Located in Hamilton this hike has two great trail options. One along the top of the escarpment from Webster’s Falls, Tew’s Falls and Dundas Peak, and back; the other a longer, more adventurous trail loop down the Spencer Gorge and back up the escarpment on the Bruce Trail. Hilton Falls Conservation Area located in Milton is another beautiful hiking trail. However there are multiple trails you can take, each are accompanied with breathtaking waterfalls and caves you can actually crawl in! The whole trail is more than 30km and ideal for mountain biking, walking, dogs and perfect to post up for a picnic. Also laid out with breathtaking views and lookout points this is definitely the best hiking spot I have personal been to!